It’s 7 a.m. on a Tuesday morning when Bray Barnes gets the call. The voice tells Barnes he has been granted a private audience with Pope Francis. He needs to be at the pontiff’s Vatican office on Saturday — in just four days. This call, however unexpected, has been hoped for and sought after. Months earlier, Barnes had written a letter to the pope informing him about the 100th anniversary of Catholic Scouting worldwide. Barnes, a Distinguished Eagle Scout and the first American to serve as world chairman of the International Catholic Conference on Scouting, wrote that he’d be in Rome in February. He wondered if Pope Francis would offer a blessing to Scouts around the world at that time. And now this call. Barnes asks the voice, belonging to a Vatican priest, whether the meeting could be pushed to February, when he’s already scheduled to be in Italy. And so Barnes gets on a plane in New Jersey and flies to Rome. The meeting is set for Jan. 25, 2014. 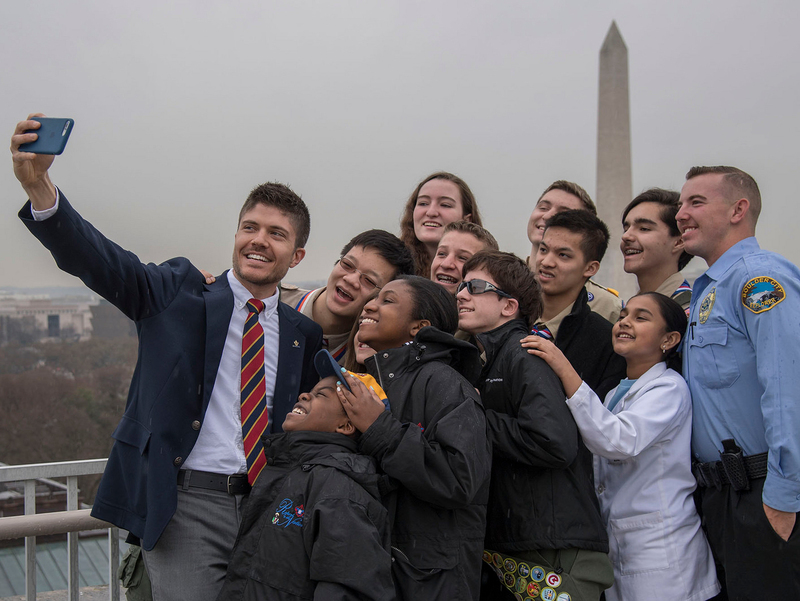 That morning, Barnes and two fellow International Catholic Conference on Scouting leaders — one from Italy and one from France — make their way to the Vatican. It’s a Saturday, and St. Peter’s Square is expectedly crowded. The trio weaves through the crowd to the front of the security line. They tell an officer they have a private audience with the pope. After a pause, they show the skeptical officer a letter from the pope’s office and get to cut to the front of the line. Once inside, the men walk through ornately decorated rooms, each with its own color palette and watched by a Swiss Guard. Everything — tapestries, upholstery, draperies — seems to bear the papal seal. They arrive at the pope’s outer office a little early and meet with the bishop secretary. “How long do we have with his holiness?” Barnes asks. “Whatever he tells you you have,” the bishop secretary says. “OK, I get that,” Barnes says. A buzzer rings. The door swings open to reveal a large wooden table surrounded by white chairs with high backs. The table and chairs rest on an Oriental rug, which itself lays on a beautifully polished marble floor. But where’s the pope? Barnes has a thought: Oh my gosh, maybe he changed his mind or something else came up. But Barnes has been looking ahead, and the pope’s desk is to the side. He looks right, and here comes Pope Francis, smiling and walking toward the group with hand extended. They exchange gifts. The pope presents the men with rosaries; Barnes gives Pope Francis a book about Baden-Powell. “Ah, si, si, Baden-Powell,” Barnes remembers the pope saying. It seems the pope knows all about the founder of Scouting. The men spend the next 30 minutes discussing Scouting. Barnes begins with an explanation of the International Catholic Conference on Scouting. The organization, headquartered in Rome, represents 6 million Catholic Scouts around the world through 68 national Scout organizations that are ICCS members. Duty to God, in America and in other countries, remains an important part of Scouting, Barnes tells him. Next, Barnes asks the pontiff whether he has a message for Scouts as Catholic Scouting enters its second century. We are just custodians. We are here for a very short period of time on Earth. When you work with Scouts, make sure that we pass along to them a good Earth and a good world. We received the Earth as a legacy by those who were before us. Such legacy does not belong to us. We simply have to take care of it for a temporary period, and we owe it to our children and those who will come after us. What a great message for Scouts, Barnes thinks. Scouts, who spend so much time enjoying the Earth, also have a responsibility to protect it. But the pope has one more message. Oftentimes our young people get sidetracked in other things, Pope Francis tells the men. They become consumed with commercialism. It may be television, cellphones, all of these things. Those aren’t what is important. The values you teach in Scouting, that’s what’s important. Make sure you teach your Scouts the importance of the values that will stay with you for the rest of your life. The worldliness, the temptations of the world, the consumerism, the research of easy pleasures, the hedonism — in other words, all those things that try to persuade us that heavens are here right now. And like that, the meeting ends. Barnes, who says he would’ve felt blessed to have just five or 10 minutes with the pontiff, enjoyed a half-hour in his company.